Welcome to the first edition of "Meet Our Ingredients". Each month we will showcase two of the ingredients we use in our products to keep you informed of what you are putting on your body, why it is so powerful and how it works to give you amazing skin. Hawaiian Healing Skin Care prides itself on using only natural and organic ingredients in each of our products. We don't include any chemicals or synthetic elements – only items nature provides. We like to say that nature knows what you need, so we are giving it to you in each amazing Hawaiian Healing product. Our first showcased ingredient is Hawaiian Astaxanthin. Hawaiian Astaxanthin is a potent marine microalga found in berries and various seafoods like salmon and krill or actually farmed in Hawaii. The red-pink pigment found in flamingo and quail feathers get their color from these micro-algaes like astaxanthin. Structurally, astaxanthin’s chemical makeup is similar to the pro-vitamin A beta carotene. According to research, there are a few chemical differences that make it even more potent in its natural form. In fact, this anti-inflammatory ingredient has been touted to have more powerful anti-oxidant capabilities than Vitamin A by itself. This is why we have made it a great addition to our Hawaiian Healing Skin Care products. 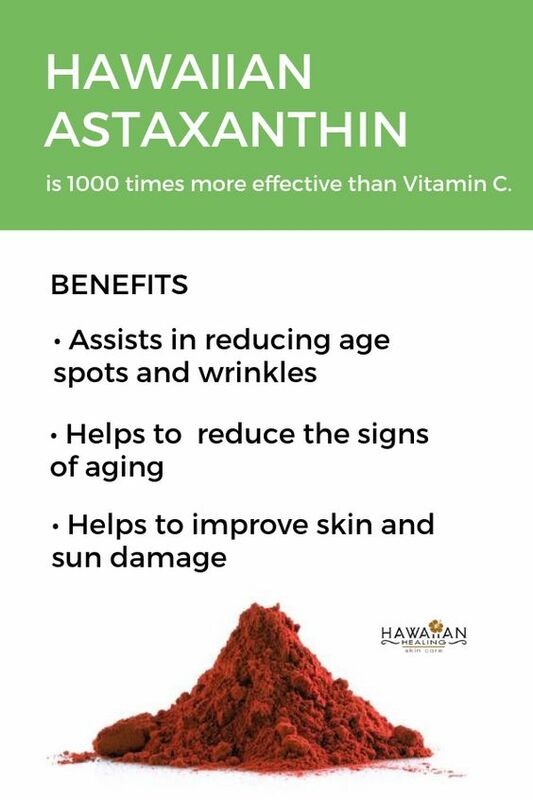 Why is Hawaiian Astaxanthin so important to have in our Hawaiian Healing Skin Care products? Astaxanthin helps stimulate production of collagen and creates cellular rejuvenation. Astaxanthin is a potent anti-aging skincare ingredient for under your eyes, face, and neck. It also has properties which help reduce free-radical damage to the skin by sun exposure when used topically. These amazing micro algae, farmed on the Big Island of Hawaii, help produce a natural, healthy glow on your skin. Think of what this great combination of ingredients can do for you! Our Hawaiian Healing Revitalizing Face Cream is FILLED with amazing, natural and organic ingredients. Our glass and bamboo packaging helps to support sustainability and is eco-friendly. By having the best ingredients sourced directly from the islands of Hawaii, it’s providing you with a Pure Hawaiian, Pure You experience.